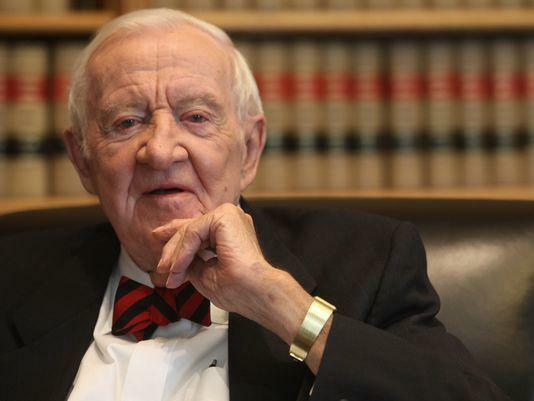 Retired U.S. Supreme Court justice John Paul Stevens, 97, called for the repeal of the Second Amendment to the U.S. Constitution – which gives Americans the right to own and bear firearms. It would also give criminals dominance over law-abiding victims who are unable to match force, not to mention the historical precident of governments disarmaming a population before committing atrocities. Stevens’ comments were prompted by the response to the Parkland shooting, in which 17 students and faculty were gunned down at Florida high school on Valentine’s day – sparking a national debate over gun control in which several students from Marjory Stoneman High have risen to instant fame, becoming overnight celebrities in the push to erode the Second Amendment. Not all Parkland students agree, however. Kyle Kashuv, a pro-2nd Amendment survivor of the shooting, has been virtually ignored by the liberal mainstream media due to his divergent opinion on gun control. Kashuv has been asking why people are protesting guns when the Valentine’s Day massacre was entirely preventable had the Broward Sheriffs Department and FBI simply done their jobs amid several reports that suspect Nikolas Cruz was likely to shoot up a school. Of note, Parkland gun-control advocate Cameron Kasky backed out of a debate wiith Kashuv. Meanwhile, Kashuv has been calling out David Hogg and other Parkland survivors over Twitter, along with CNN’s Brian Stelter who recently admitted that he allowed the Florida wing of the Mickey Mouse gun control club spew false information over his network (shocker!). A repeal of the Second Amendment can be proposed with a two-thirds vote in the U.S. House of Representatives and the Senate, or by a constitution convention assembled by two-thirds of the states, and ratified by three-fourths of the 50 states. Or, they can just whittle down the Amendment until it’s unrecognizable and effectively neutered. Useless old retired leftist. His comments are as predictable as his opinions. If it is against america, he is for it. THIS MAN SERVED “35 YEARS”ON THE SUPREME COURT AND IT SHOWS WHY WE NEED TERM LIMITS. THIS MAN SHOULD GO BACK TO THE HOME HE CAME FROM .AT 97 YEARS OF AGE CAN HE BE THINKING RATIONALLY ABOUT WHAT WE THE PEOPLE NEED AND WANT?WE HAVE ANOTHER ON THE SUPREME COURT NOW WHO VOTES HER OPINION WHEN THEY CAN WAKE HER UP .TIME FOR CHANGE .PUT IN TERM LIMITS. What is he another liberal demo socialistic communist?